Butchers Creek in Omeo, Victoria. A stream, brook, beck, burn, creek, crick, kill, rill, syke, bayou, rivulet, or run is a body of water with a current, confined within a bed and banks. 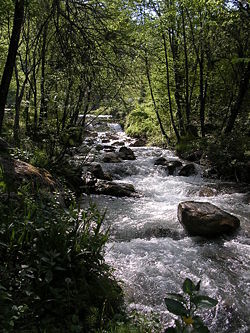 The biological habitat in the immediate vicinity of a stream is called a riparian zone. In the scientific community, stream is also an umbrella term for all types of flowing natural waters, regardless of size. The study of streams and waterways in general is known as surface hydrology and is a core part of environmental geography. Streams are important as conduits in the water cycle, instruments in aquifer recharge, and corridors for fish and wildlife migration. By connecting fragmented habitats, they help conserve biodiversity. Beck is used in Yorkshire, Lancashire and Cumbria. 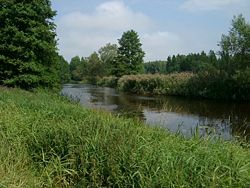 Brook is used in the Midlands. Stream is limited to Southern England. Kill in New York, Pennsylvania, Delaware, and New Jersey comes from a Dutch language word, as in Peekskill (NY), Fishkill (NY), Broadkill (DE), Schuylkill (PA) and Fresh Kills. 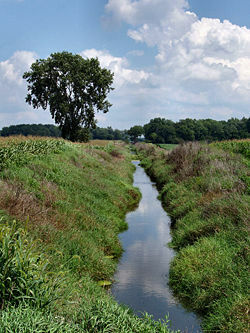 Run in Ohio, Maryland, or Virginia can be the name of a stream, as in Bull Run or Difficult Run. 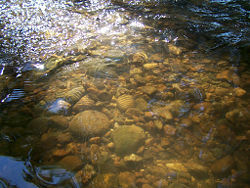 Branch, fork, or prong can refer to tributaries that share the same name as the main stream. Yellow River in rural Indiana, USA. Rivers of this size are often referred to as "creeks." A small to medium sized natural stream. Sometimes navigable by motor craft and may be intermittent. In some dialects it is pronounced: "crick." A tidal inlet, typically in a saltmarsh or mangrove swamp. Alternatively, flowing water between enclosed and drained, former saltmarshes or swamps. In these cases, the stream is the tidal stream, the course of the seawater through the creek channel at low and high tide. A contributory stream, or a stream that does not reach the sea but joins another river (a parent river). Sometimes also called a branch or fork. 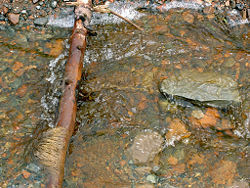 A stream smaller than a creek, especially one that is fed by a spring or seep. It is usually small and easily forded. A brook is characterized by its shallowness and its bed being composed solely of rocks. In some regions, it is equivalent to "creek"; in other regions, it may be smaller than a creek or deeper than a creek of the same width. A brook in the Bay of Fundy, Nova Scotia. The point at which a stream emerges from an underground course through unconsolidated sediments or through caves. 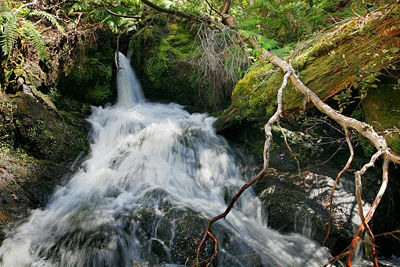 A stream can, especially with caves, flow above ground for part of its course, and underground for part of its course. A depression created by constant erosion, that carries the stream's flow. Flatlands on either side of the stream that are subject to seasonal flooding. The gradient of a stream is a critical factor in determining its character, and is entirely determined by its base level of erosion. The base level of erosion is the point at which the stream either enters the ocean, a lake or pond, or enters a stretch in which it has a much lower gradient, and may be specifically applied to any particular stretch of a stream. In geologic terms, the stream will erode down through its bed to achieve the base level of erosion throughout its course. If this base level is low, then the stream will rapidly cut through underlying strata and have a steep gradient, and if the base level is relatively high, then the stream will form a flood plain and meanders. Meanders are looping changes of direction of a stream caused by the erosion and deposition of bank materials. These may be somewhat sine-wave in form. Typically, over time, the meanders don't disappear but gradually migrate downstream. If some resistant material slows or stops the downstream movement of a meander, a stream may erode through the neck between two legs of a meander to become temporarily straighter, leaving behind an arc-shaped body of water termed an oxbow lake or bayou. A flood may also result in a meander being cut through in this way. In the United States, an intermittent stream is one that only flows for part of the year and is marked on topographic maps with a line of blue dashes and dots. A wash or desert wash is normally a dry streambed in the deserts of the American Southwest which flows only after significant rainfall. 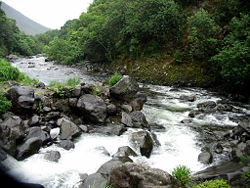 Washes can fill up quickly during rains, and there may be a sudden torrent of water after a thunderstorm begins upstream, such as during monsoonal conditions. These flash floods often catch travelers by surprise. An intermittent stream can also be called an arroyo in Latin America, or a wadi in the Arabic-speaking world. In Italy an intermittent stream is termed a torrent Template:In it. In full flood the stream may or may not be "torrential" in the dramatic sense of the word, but there will be one or more seasons in which the flow is reduced to a trickle or less. Typically torrents have Appenine rather than Alpine sources, and in the summer are fed by little precipitation and no melting snow. In this case the maximum discharge will be during the spring and autumn. However there are also glacial torrents with a different seasonal regime. A blue-line stream is one which flows for most or all of the year and is marked on topographic maps with a solid blue line. In Australia, an intermittent stream is usually called a creek, and marked on topographic maps with a solid blue line. Generally, streams that flow only during and immediately after precipitation are termed ephemeral. There is no clear demarkation between surface runoff and ephemeral stream. The entire basin drained by the stream is termed the drainage basin, also known in North America as a "watershed," and in British English as a "catchment." A basin will typically be composed of smaller basins. For instance, the Continental Divide in North America divides the Atlantic Ocean basin from the Pacific Ocean basin, but the Atlantic Ocean basin may be first divided into the Atlantic Ocean drainage and the Gulf of Mexico drainage. This delineation within the United States is termed the Eastern Continental Divide. The Gulf of Mexico basin may be divided into Mississippi River basin and a number of smaller basins, such as the Tombigbee River basin. The Mississippi River basin includes the Ohio River basin, which in turn includes the Kentucky River basin, and so forth. Gordon, Nancy D., et al. 2004. Stream Hydrology: An Introduction for Ecologists. 2nd ed. Chichester, West Sussex, England: Wiley. ISBN 9780470843581. Hauer, F. Richard, and Gary Anthony Lamberti. 2007. Methods in Stream Ecology. 2nd ed. Amsterdam: Academic Press. ISBN 9780123329080. Leopold, Luna B. 1997. Water, Rivers, and Creeks. Sausalito, CA: University Science Books. ISBN 0935702989. Leopold, Luna B. 2006. A View of the River. Cambridge, MA: Harvard University Press. ISBN 9780674018457. Schumm, Stanley Alfred. 2003. The Fluvial System. Caldwell, NJ: Blackburn Press. ISBN 9781930665798. Earth's water: Rivers and streams.